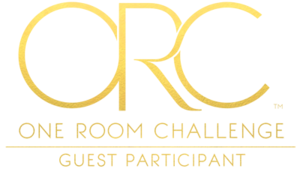 It's officially two weeks before reveal time of the One Room Challenge. It's fine, I'm fine. Everything's going to be okay. Or, you know, it might not. It could really go either way. Patrick laid the first wall of tile in the shower on Saturday. It was his first time laying wall tile, and I'm really impressed with how he did. There's a little bit of a bow in the middle of the wall that he had to work around, but he made it look good. He started on a temporary board that gave him a nice level first course. After debating every conceivable tile pattern, we went with a classic offset brick pattern. We opted to go with vertical pieces, or soldiers, for the top course to help disguise our imperfect ceilings. Our biggest challenge is finding the time to get anything accomplished. This week was the second in a row where life didn't leave us any real room for progress. Literally the only time we got to work was Saturday, when Patrick tiled the first wall of the shower. It felt like the tile was going up really quickly, but all of the sudden it was 4pm and we had to rescue our girls from My Little Pony, scoop their brains back into their heads, and go for a bike ride (them) / run (us). Patrick's taking tomorrow off from work to (hopefully?) finish tiling the shower walls, and we'll have most of Saturday, Sunday, and all evenings next week to work on the bathroom. To check out the other participants (who hopefully have more to show for their time than I do), click here.